Window shopping takes on a new meaning when it comes to custom homes. When you have unlimited options, it’s hard to narrow it down, especially when you don’t know what’s out there. Here’s a quick lesson in window types, so you can start thinking about how you want to let light into your custom designed home. 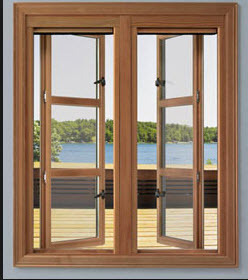 Double Hung windows slide up and down in the frame, meaning that they can open from the top or the bottom. They look like a common single hung window, but the single hung window only opens from the bottom. These windows are on a hinge and swing outward. They are usually side by side and give the appearance and convenience of a French Door to the outside- in window form. They are typically operated by a crank or other mechanism. Picture windows are generally chosen because they let the maximum amount of light in. If you love the natural view from your property, you’ll love picture windows overlooking the landscape. They are meant to be an unobstructed source of light. A slider window slides in one direction or another, with one window sliding over the other to open horizontally. These are very common for kitchen windows, or high bathroom windows. Bay windows are protruding. They can give you more interior space or can be used to create a small nook or window seat. Sometimes these windows are combined with a stationary window to create the protruding effect. A transom window is a window that is typically placed above another, larger window or a door. It is typically used to let more light in, or for decorative purposes. Though horizontal windows are the traditional form, there are many different styles of transom windows. They can be elaborate or simple, and are a great design addition. What types of windows do you have in your home? What type would you love to have in your dream home? Let us know in the comments below! Learn about different types of windows here. Use our window types guide below.